Alright, time for another post. For today I picked another of Abigail's heart's complexities, namely Pulmonary Stenosis (PS). There are several forms of this abnormality and Pulmonary Stenosis may occur in couple different places of the heart-lung circulation system. Let's start with a short description of what Pulmonary Stenosis means. Basically it means there is an obstruction to the blood flow from right ventricle (right, lower pumping chamber) to the lungs. 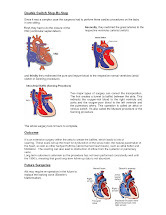 Since there's an obstruction, it is harder for the right ventricle to pump the deoxygenated blood to the lungs. Heart needs to work harder, and depending on how severe the PS is, even much harder, leading to congestive heart failure. Here are couple possible variations of Pulmonary Stenosis. The most popular, Pulmonary Valve Stenosis occurs when the obstruction of blood flow is caused by the tricuspid valve. The tricuspid valve has 3 leaflets (3 cusps) which open fully when the hurt pumps blood to the pulmonary artery and closes, when the right ventricle relaxes, to avoid a back-flow of blood from pulmonary artery to the heart chamber. When the tricuspid valve leaflets are fused together, or the valve is malformed and there are 2 cusps (leaflets) instead of 3 (then it's called 'bicuspid valve'), the valve does not open fully, obstructing blood flow. Subvalvular Stenosis, is a blood flow obstruction that occurs just below the Pulmonary Valve, in the upper part of the right ventricle called the outflow tract. The outflow tract is a muscular tunnel that normally is wide open, unobstructed and participates in pumping blood to the lungs. When the outflow tract is abnormally thickened, it can cause Subvalvular Stenosis, also called subpulmonic or infundibular stenosis (infundibular from the name of the outflow tract muscle- infundibulum). 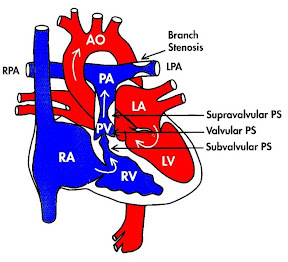 Supravalvular Pulmonic Stenosis is a narrowing of the Pulmonary Artery just above the Pulmonary Valve. When the Pulmonary Artery narrows after it branches off to the left and right lung then we talk about Peripheral Pulmonary Artery Stenosis or Branch Pulmonary Artery Stenosis. Unless the PS is very severe there will be no symptoms, other than heart murmur. In a very young child it will also lead to cyanosis, blue discoloration resulting from low blood oxygenation. Very mild PS may not require any treatment, but the child will have to be closely monitored by pediatric cardiologist. Severe PS may require ambulatory or surgical treatment, depending on the severity of PS, placement and overall condition of the patient. Pulmonary Valve Stenosis can be treated by inserting a small balloon placed at the tip of a catheter through patient's groin area, to the valve and blowing it up, opening the valve. The procedure is called ballon valvuloplasty. Ballon Valvuloplasty happens under deep sedation and usually patients are discharged from the hospital within 1 to 2 days. If the narrowing reoccurs, the procedure may be repeated, or patient referred to surgery. Subvalvular Stenosis (obstruction below Pulmonary Valve) or Supravalvular Stenosis (obstruction above Pulmonary Valve) is usually repaired through an open heart surgery after putting the patient on a heart-lung (bypass) machine. During the surgery the obstructing muscle can be removed, or partially removed, or valve opened, if dealing with fused valve cusps. When dealing with Peripheral Pulmonary Artery Stenosis, the narrowed artery can be patched, or alternatively a catheter ballon dilation can be performed to stretch the arteries. Unless the child is very sick, the recovery time after the surgery is usually couple days. 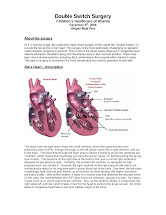 In Abi's case, we dealt with Subvalvar Pulmonary Stenosis, since her left ventricle was doing the job of the right ventricle and was on the non-systemic side, the blood was going out through a bicuspid valve. Also, to add to the complexity, her tricuspid valve was malformed (Ebstein's Malformation), which means it was located lower than it should, and it was close to the VSD, causing one of the leaflets to leap through the VSD and further obstruct blood flow to the lungs. I hope this is a pretty clear and not too long description of Pulmonary Stenosis. There are many great resources out there, if you are interested in getting more in-depth information.